"We were now on the western edge of Liwa, which our guide said extended eastward for three days's journey. 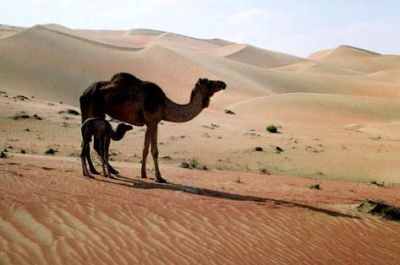 I should have liked to explore this famous oasis, but our camels were exhausted and we ourselves were worn out. Our food was nearly finished and it was difficult to buy anything here but dates. I knew that we must go direct to Abu Dhabi, and could only hope that perhaps I should be able to come back later. We passed through the settlements of Qutuf and Dhaufir. Palms were planted along the salt-flats, close under high steep-sided dunes, and in hollows in the sands. The groves were fenced in, and other fences were built along the dune-tops, to try to control the movement of the sands, which in a few places had partly buried the trees. They were carefully spaced, and evidently well tended. There was no other cultivation, probably because of the salt on the surface of the ground. Water was abundant at a depth of between seven and twenty feet. It was scarcely brackish, tasting only a little flat. The Arabs here were Bani Yas. They lived in rectangular cabins made from palm fronds, built for the sake of coolness on the downs above the palm groves, two or three cabins being enclosed by a high fence and inhabited by one family. They owned some camels and a few donkeys and goats, and in the summer many of them went to Abu Dhabi to join the pearling fleet as divers. We left Liwa on 7 March." (Thesiger 1991: 261). 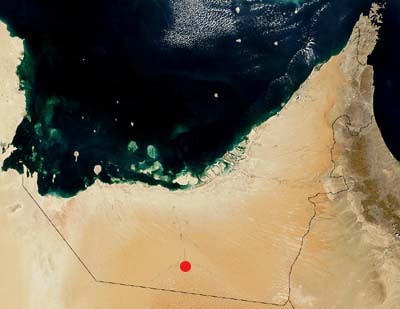 Liwa - website of the German archaeological team's work in the Liwa Oasis, directed by Dr. Heiko Kallweit, Orientalisches Seminar der Albert-Ludwigs-Universität Freiburg, Germany. Series of Liwa pictures taken by Salwa Ghaly. Harris, A. 1977. The Liwa Oasis. Bulletin of the Emirates Natural History Group 2: 11-13. Harris, A. 1998. A Late Stone Age Site south of the Liwa Oasis. Tribulus (Journal of the Emirates Natural History Group) 8.2: 24-27. [ to download this article in Acrobat .pdf format click here (2.6 MB) ] . Heard-Bey, F. 1979. Development Anomalies in the Bedouin Oases of Al-Liwa. Bulletin of the Emirates Natural History Group no. 8: 2-16. Thesiger, W. 1991. Arabian Sands. Penguin Travel Library, Penguin Books (1st edn. 1964 -1991 reprint).